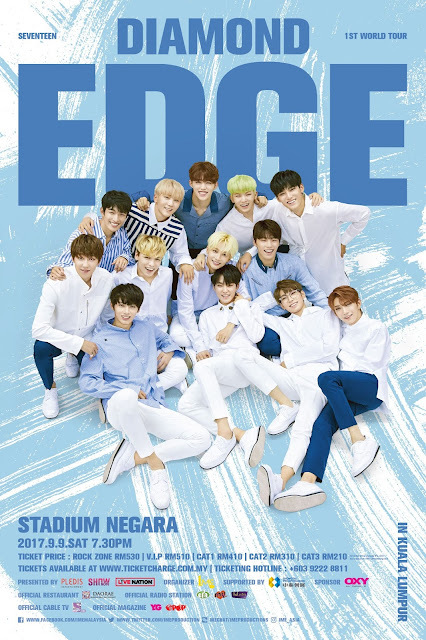 GOKPOP | Exclusive K-News in Malaysia & Singapore: SEVENTEEN to bring “2017 SEVENTEEN 1ST WORLD TOUR "DIAMOND EDGE" to Kuala Lumpur! 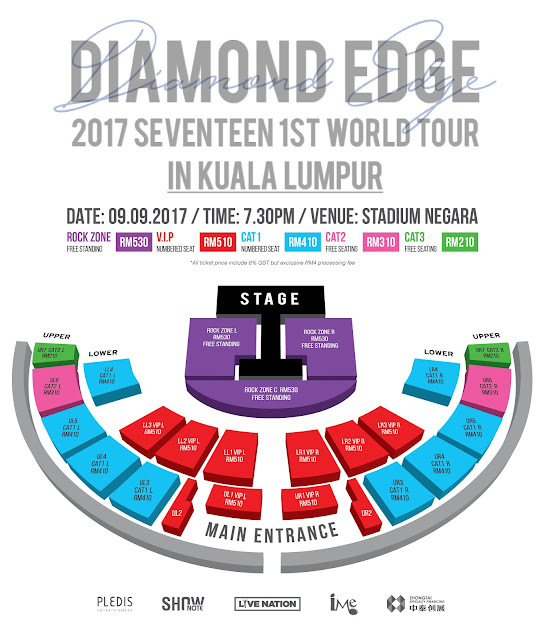 SEVENTEEN to bring “2017 SEVENTEEN 1ST WORLD TOUR "DIAMOND EDGE" to Kuala Lumpur! Malaysian Carats are more than excited right after the announcement of SEVENTEEN world tour in Malaysia and have been waiting for the ticket launch announcement. Today, the organiser IME Asia finally announced the long-awaited ticket launch which will be on-sale starting from 9th July 2017 (Sunday) at 1st Floor of Boulevard Entrance, Cheras Sunway Velocity Mall from 11am to 3pm. Ticket Outlet sales will begin on the 10th of July (Monday) at Ticket Charge Office and selected outlets such as Speedy video, Rock Corner, Chambers Music, PJ Live Arts, information counter at The Mines shopping mall and 1 Shamelin. Outstation outlets are Eden Ultimate (Kuantan) and Blonde Brunette (Penang). You may call TicketCharge hotline +603-92228811 for more info regarding the ticket sales. Although SEVENTEEN has yet to debut in Japan but they held 6 concerts titled 'Say The Name #Seventeen and attracted a total of 50,000 fans to the concert. Additionally, their latest album has reported to sell over 190,000 copies and has charted the top 10 most album sales in the first week of its released. SEVENTEEN's growth and popularity has expanded from Korea, Japan, Asia to Europe, US and many more. They will visit 13 cities including North America for the 2017 SEVENTEEN 1st WORLD TOUR “DIAMOND EDGE” concert. For more info, check out IME Asia Facebook, @IME_Asia on Instagram, @IMEProduction on Twitter, or @IMEProductions on WeChat.